This page includes the force field topology and parameter files for the polarizable force field based on the classical Drude oscillator model. The force field is actively undergoing development such that extensions as well as updates of the force field should be anticipated. 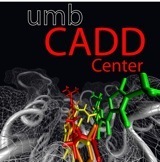 Utilities to convert CHARMM additive RTF and coordinate (pdb or crd format) files into Drude format files along with input files for MD simulations using CHARMM or NAMD are available in the Drude Prepper module that is part of the CHARMM-GUI. Note that the format of the files is as CHARMM stream files (ie. toppar stream file) with each stream file containing both the RTF and parameter information for the specific classes of molecules. In all cases the master toppar file, that also contains the current protein Drude polarizable model, must be streamed first. Current release: Includes 2017 and 2018 updates of the nucleic acid force field (now includes both DNA and RNA), of the lipid force (including a wider range of lipids) and extension of the carbohydrates to include glycosidic linkages allowing for treatment of poly and oligosaccharides. Please see details in our recent publication regarding the implementation of the Drude force field and extended Lagrangian dynamics in GROMACS. At this time, only the NVT ensemble with the md-vv integrator is supported with the extended Lagrangian, but the SCF regime supports NVT and NPT with any integrator. The current tarball is only compatible with the latest version of the Drude code (see below) as it requires changes to the RTP format. NOTE that the implementation of the Drude model in GROMACS is ongoing. NBTHOLE is not yet implemented, so please refer to nbthole.itp to see if your simulation requires NBTHOLE. If it does, run your simulation in CHARMM, OpenMM, or NAMD. Progress on the implementation of various features in GROMACS will be posted here and on the gmx-users mailing list. Click here for a pre-equilibrated box of SWM4-NDP water. Please note that the GROMACS implementation requires a different atom order for SWM4-NDP in order to use the SETTLE algorithm for constraints. Files prepared with CHARMM will not work. Example input files (.mdp) for GROMACS are provided in the supporting information of the paper. Compile and install as you would any other (post-5.0) GROMACS version.